﻿Parking lot striping is a necessity for all brick and mortar business located in Lewisville, Texas in the southern area Denton County. Of course businesses all over the world need to have their parking lots striped from time-to-time, but I am focusing on the great suburb north of Dallas for this article. Even though we are physically located in Plano, it is a hop, skip, and a jump to Lewisville, and we would be glad to come serve you. Lewisville, history dates back to the 1840’s, however the city never did incorporate until 1925. From that point forward the city growth has continued to rise despite multiple issues with the economy. As of today the United States Census Bureau states that over 101,000 people live in Lewisville. I only tell you this to show the fact that with this type of population, there are a lot of small businesses in the area, and with small businesses come parking lots. I know it is not a fun topic for most folks, but for a guy with a machine, some paint and a knack for making straight lines, it is pretty darned exciting. If you are a small business owner, some of the things you face, and sometimes unexpectedly, are parking lot maintenance issues. Depending on the type of material your parking lot is constructed from, you could face potholes, and cracks, faded markings, non-compliant markings, and simply dirt, grim, and trash. Never fear, we are here to assist you with all of your parking lot issues. Our goal is to make you look good from the second your customers and visitors set foot on your property. No matter what you need done to your parking lot, we are here to serve you. We are ready to come give you an estimate of the price, and time-frame it will take to stripe your parking lot. We will make sure your parking lot is compliant for all American Disabilities Act (ADA) regulations, and also make sure your lot meets all city and county fire and emergency regulations. We are trained, and knowledgeable of all the codes in the DFW area and will make sure you also have a clear understanding of all codes we need to follow. Is your parking lot looking shabby simply because it needs to be cleaned? You may find your parking lot covered with gum, oil, grease, grim, dirt, etc. We are experts with the pressure washer, and will make your parking area shine like new. We would love to give you a quote on our pressure washing services and then transform your parking lot to look like new. Have you fallen victim of graffiti? Having your property destroyed by others is simply heart wrenching to know that your property was destroyed at the hands of others. When you do fall victim of graffiti there is typically a sense of urgency to have the graffiti cleaned up right away. For one having graffiti on your property sends a message to your patrons that maybe your business is not safe for them to be there, or maybe the graffiti says things that the general public should not be reading. Either way, the good news is we can get rid of paint, and other marking materials that appear to be permanent. If you have experienced this senseless lack of respect from others destroying your property, contact us, and we can come clean it up for you right away. Speed bumps take a lot of wear and tear, and the paint that is covering them takes the brunt of that abuse. You always want to make sure your speed bumps are clearly visible to reduce the amount of damage that can be caused by them (both to vehicles and to humans). If the vehicles in your parking lot cannot see the speed bumps clearly, they can easily drive to fast and harm their car as they drive over them. For humans if the speed bumps are not clearly marked it is easy for them to trip and fall. So making sure your speed bumps are clearly marked is paramount and can save you a lot of hassle of dealing with angry or hurt customers. If your speed bumps need attention, we are ready to help. Keeping the flow of traffic moving in the right direction is often time as easy as having an arrow placed directly on the pavement. 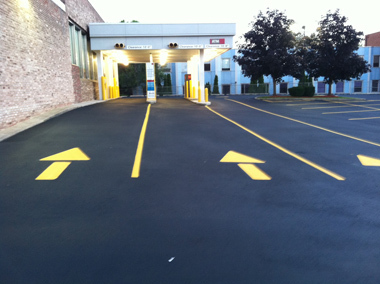 You have to remember that when a customer enters your lot they are typically confused, or not familiar with the surroundings and may be looking for arrows pointing them in the way they should proceed. If you happen to have a need for arrows or other stenciling, be sure to let us know and we will include that in the quote to you. We may also make recommendations if we see the need for you to have directional arrows or other markings that you may not be aware of.